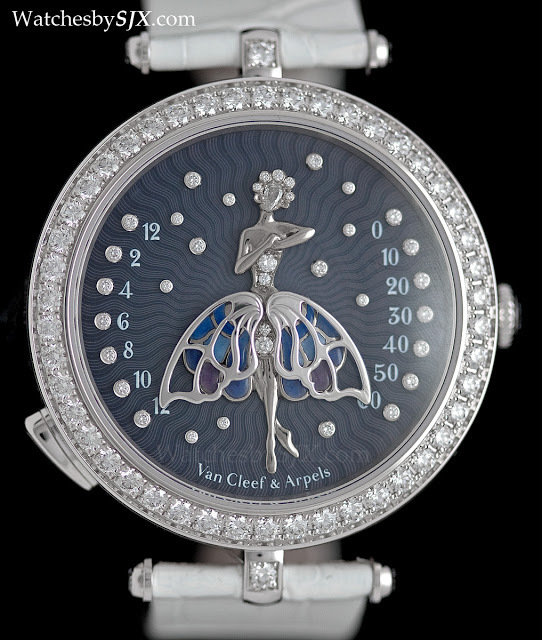 This year Van Cleef & Arpels continues with its speciality of jewelled ladies’ watches, mostly in an Art Nouveau style. 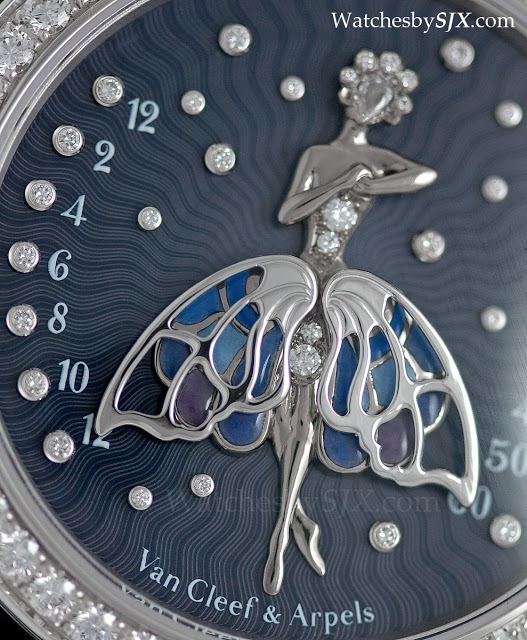 Unlike previous years, however, VC&A did not have a major new Poetic Complication (the brand’s range of ladies’ complicated watches) to present. 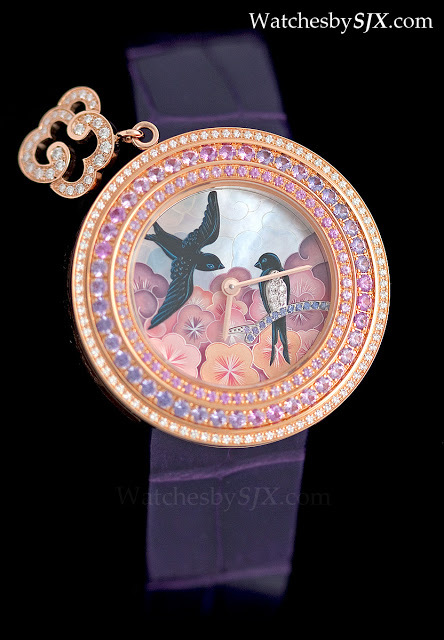 Last year for example VC&A unveiled the impressive pair of Poetic Wish Five Minute Repeaters. 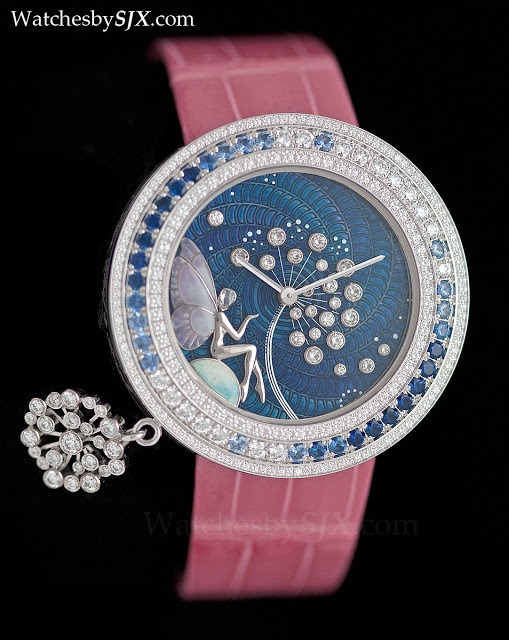 Reminiscent of the Poetic Complication Féérie which inaugurated the Poetic Complications line six years ago, the new Lady Arpels Ballerine Enchantée is similar to the double retrograde watches of previous years, but it differs in two key respects. 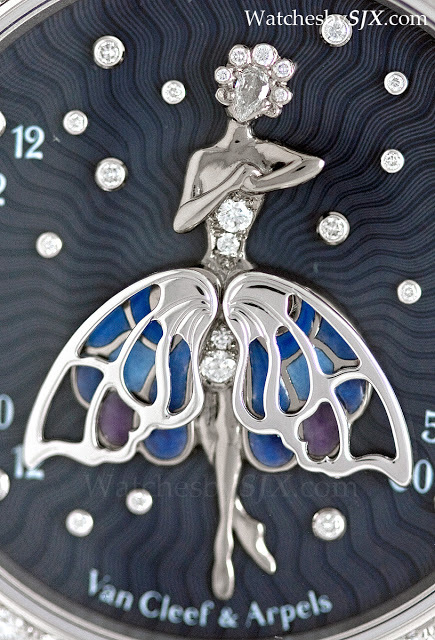 While the earlier Poetic Complications had retrograde time displays, the Ballerine Enchantée shows the time on demand: pressing the button at eight o’clock causes each half of the ballerina’s skirt (shaped like the wings of a butterfly) to rise to indicate the time, starting with the hours on the left and then minutes on the right. Once up, each veil pauses momentarily for the time to be read, before returning to its original position. 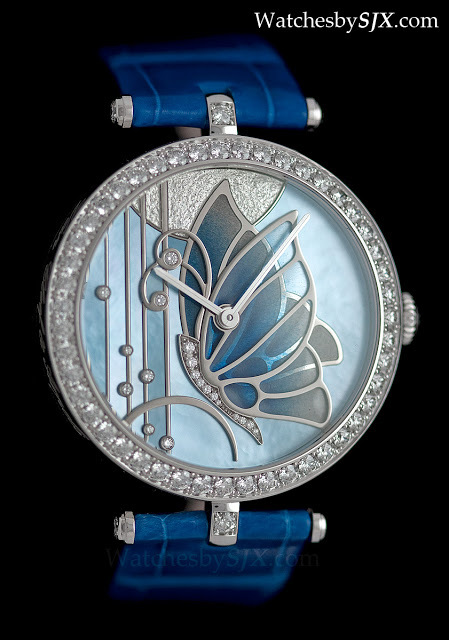 And unlike the previous Poetic Complications which were done by Jean-Marc Wiederrecht at Agenhor, the Ballerine Enchantée movement was created by La Fabrique du Temps, the complications specialist owned by Louis Vuitton, best known for its work on Laurent Ferrier’s beautiful movements. 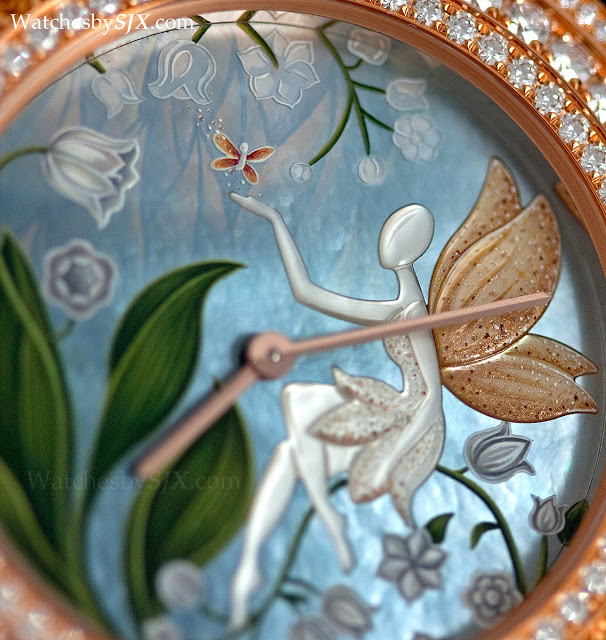 As is typical for VC&A, the dial of the Ballerine Enchantée is elaborately decorated. 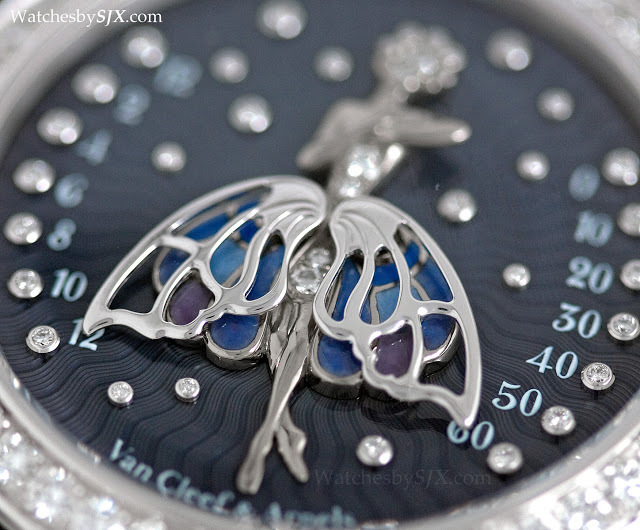 The ballerina is in solid gold with an enamelled skirt, set against a translucent, purple guilloche enamel dial. 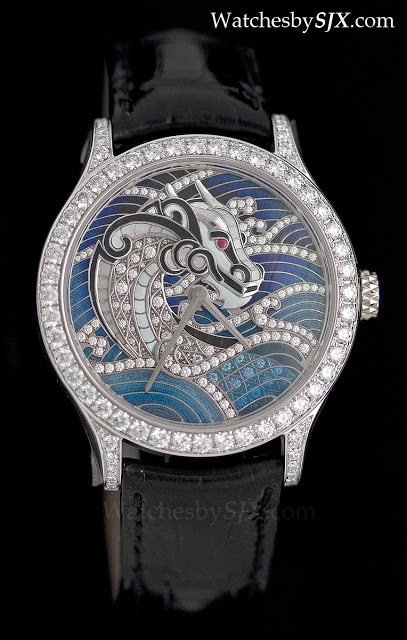 Both the dial as well as bezel are set with diamonds. 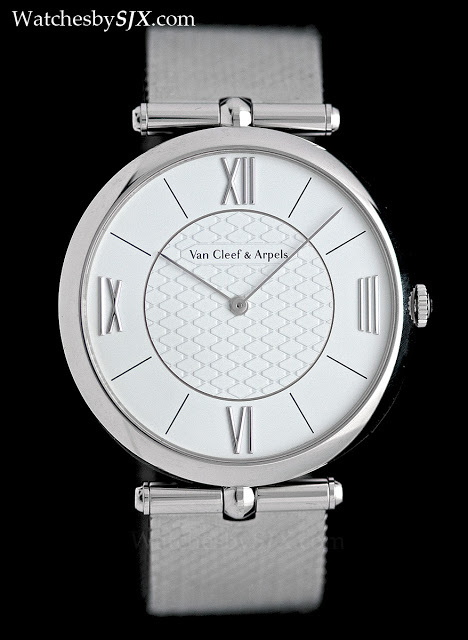 And the case is white gold with a diameter of 40.5 mm. 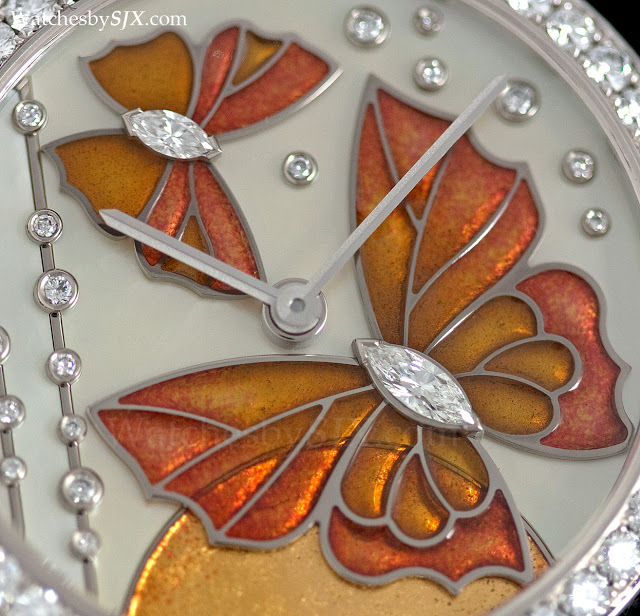 With similarly decorated dials, but sans complications, is the VC&A Extraordinary Dials collection. 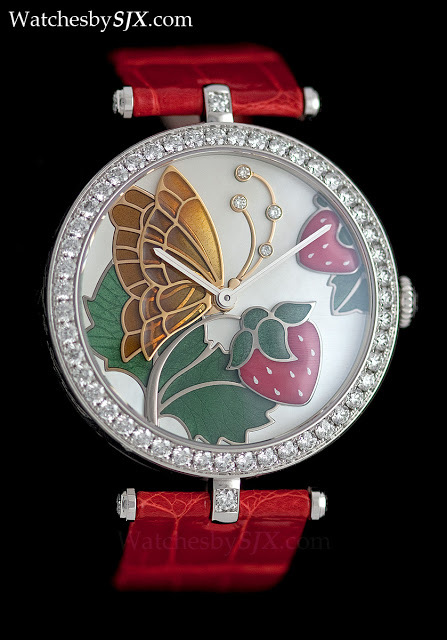 This year sees five wristwatches with butterfly motifs added to the collection. 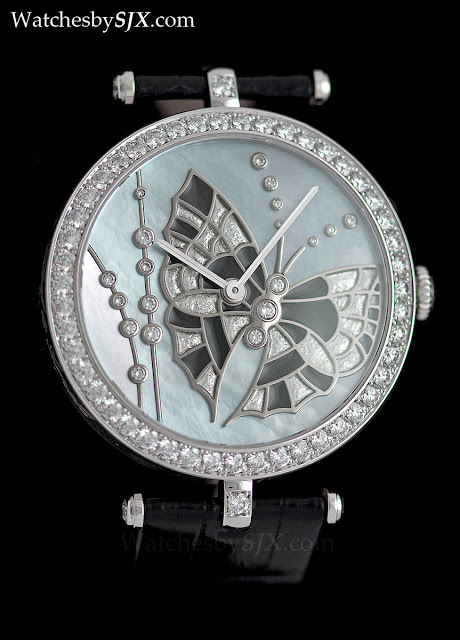 All of the Papillons Extraordinary Dials are in white gold and 36 mm in diameter. 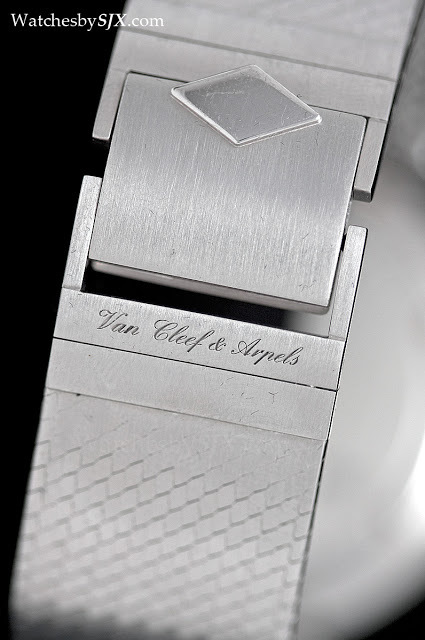 Inside is a hand-wound movement, I believe from Piaget. 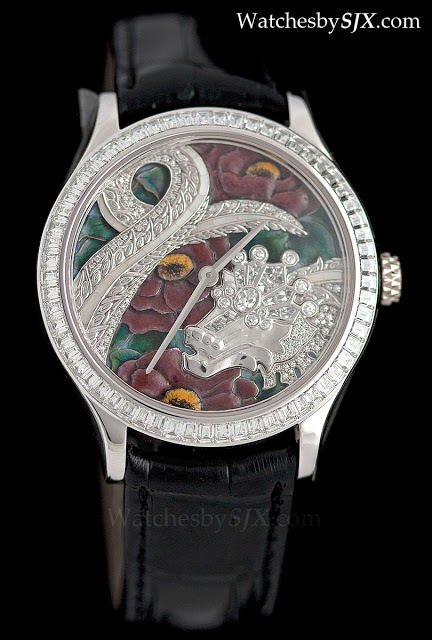 The dials have a mother of pearl base, and decorated with various techniques of enamel as well as diamonds. 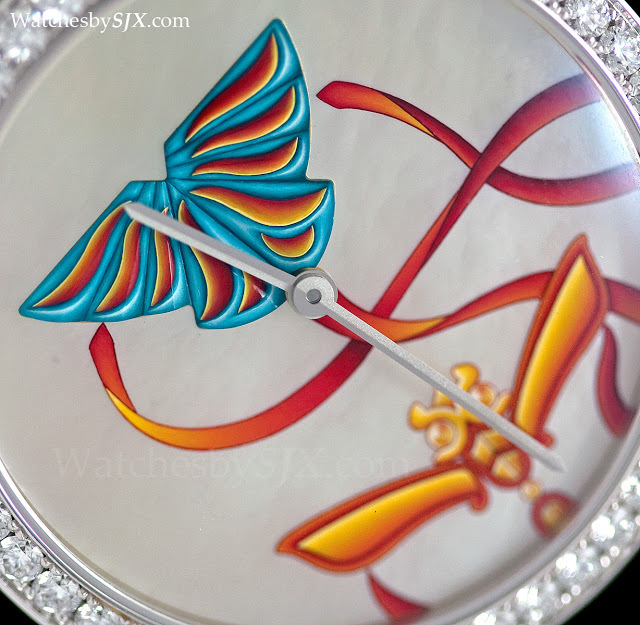 The colours, depth and texture of the dials are beautiful. 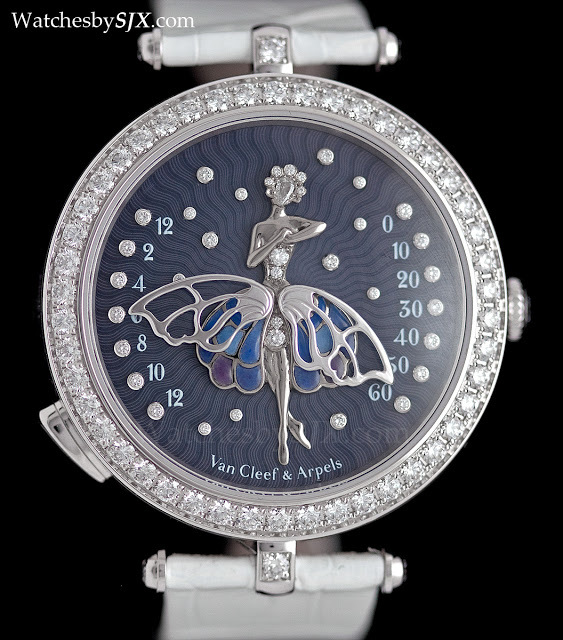 Each is limited to 22 pieces, except for the Lady Arpels Papillon Extraordinaire which is part of the regular collection. 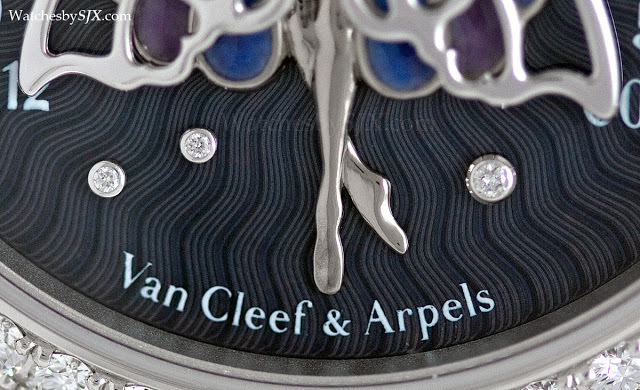 Also new is the Cerfs-Volants Extraordinary Dials. 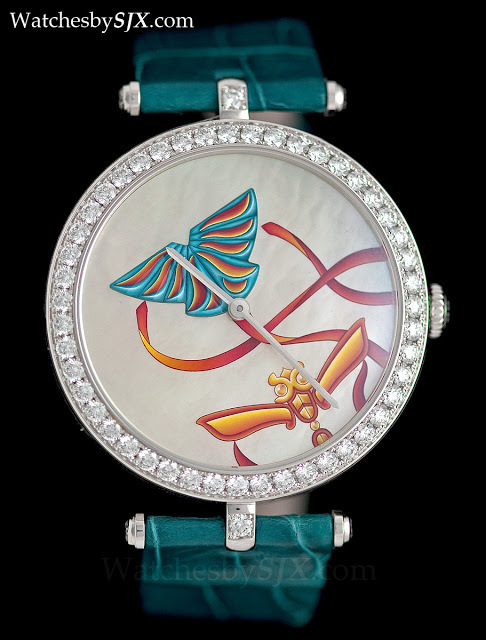 These depict kites, done in miniature painting, on a mother of pearl dial. 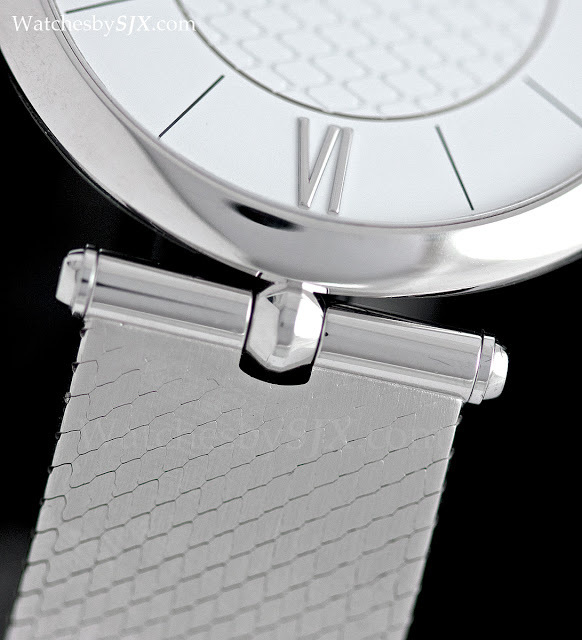 These are also limited to 22 pieces in 38 mm white gold cases, with a hand-wind movement. There are four versions available, but for some reason I only have photos of two. An entirely new ladies’ model is the Charms Extraordinaires. 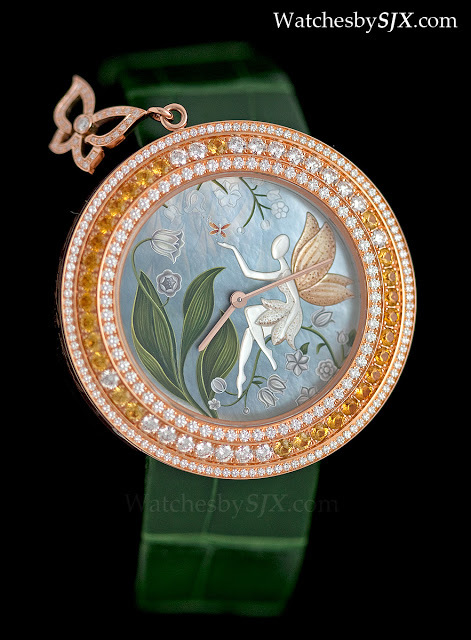 Available in four different guises, the Charms Extraordinaires has a jewelled lucky charm attached to a ring around the case of the watch. 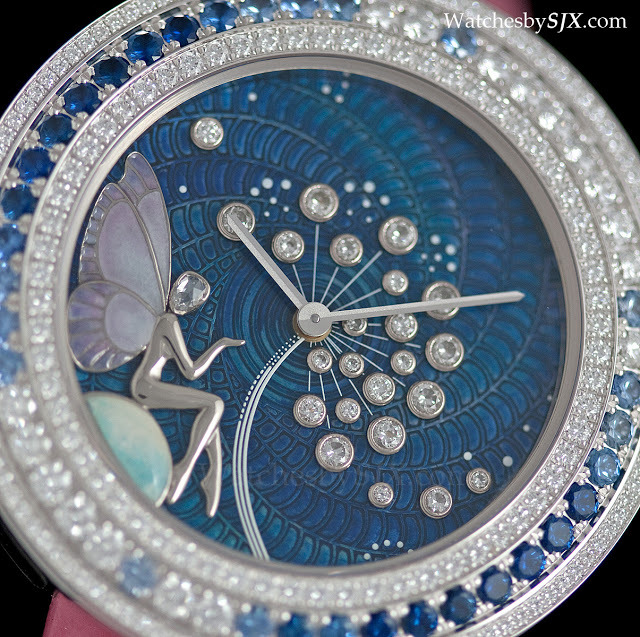 The ring is not fixed, so the charm freely travels around the case. 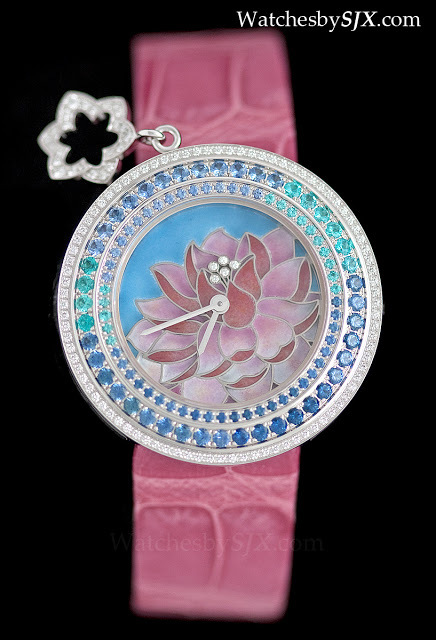 All of these are quartz, in a 32 mm case in either white or pink gold. 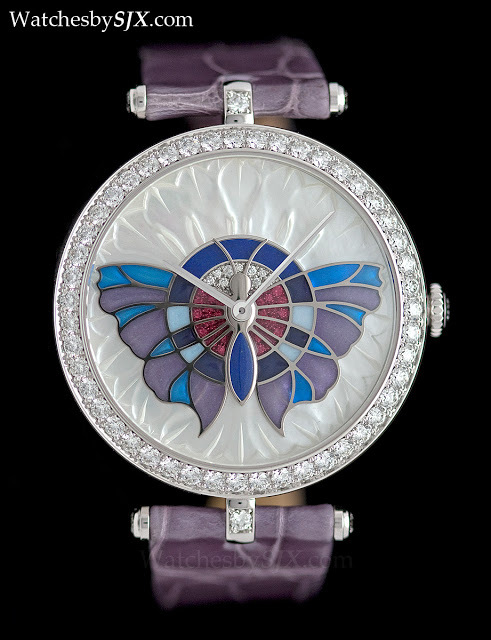 The bezels are set with diamonds and precious stones. 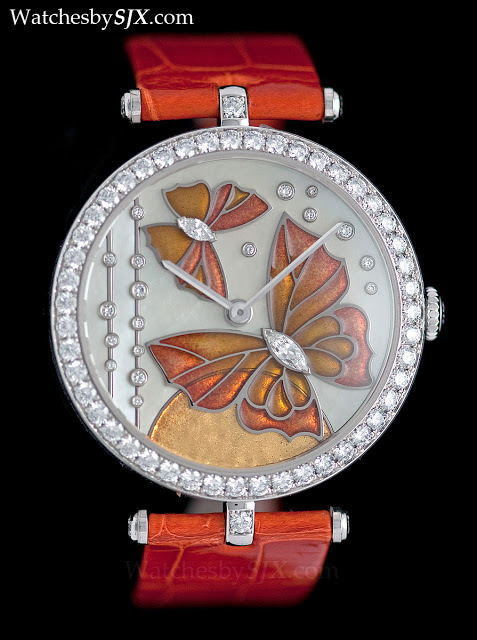 The dials are decorated with either miniature painting on mother of pearl or enamel, and set with gems. Each is limited to 22 pieces. 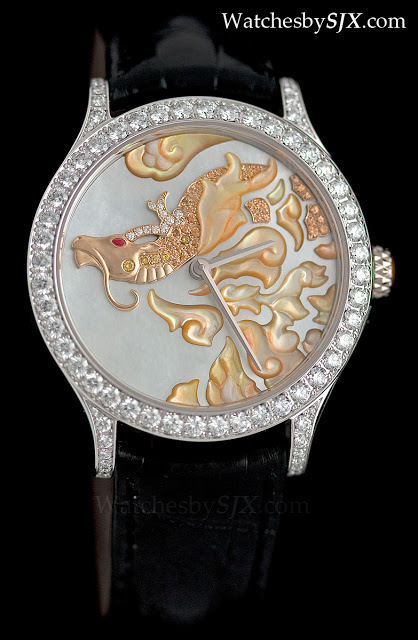 Similarly lavishly decorated but in the larger 40 mm Midnight case is a series of four watches depicting dragons on the dial. 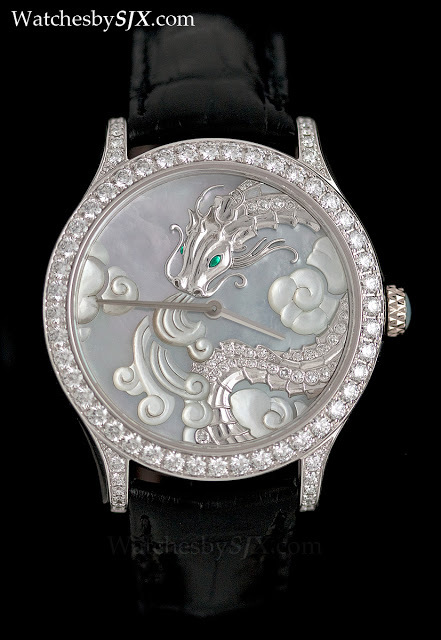 Like the other watches from the Extraordinary Dials collection, these dragon motif watches are beautifully executed. 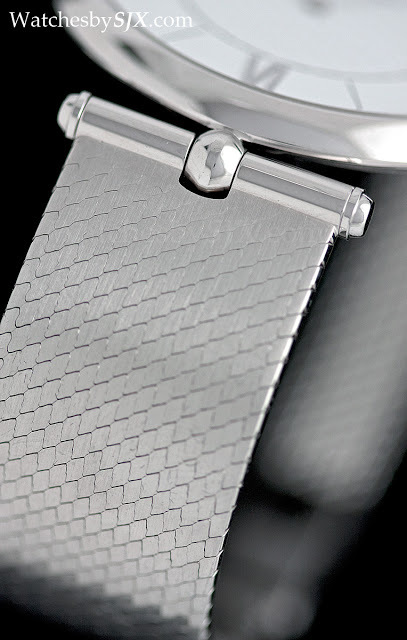 Last is the Pierre Arpels ultra thin on bracelet. 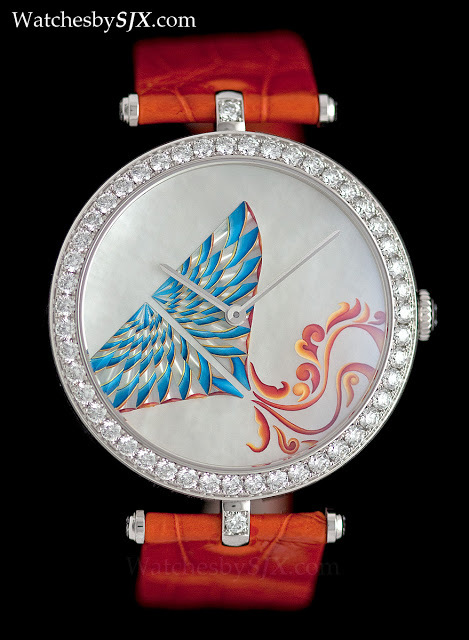 Launched last year on a leather strap, the Pierre Arpels is now available with a fine and supple bracelet – it reminds me of mesh bracelets from the seventies – that perfectly suits the watch. In fact, I daresay it looks better on a bracelet than on a strap.